Sometimes it is just easier that way, even when I know it is not the truth. I can see that I will finish this baby blanket, but possibly, not by week's end the way I hoped. I was so pleased to have completed and sewed together the four center squares, but then there was the picking up and knitting. That process bothered my hands and wrists, but I finally had 484 stitches and was on my way with the edging. I only have about 55 more rounds to go, and right now, it is only 556 stitches around, but at the end, a round will consist of 756 stitches. Perhaps I should not look any further at these numbers. Instead, I will look again at the completed, sewn-together center. If go for a small project, surely that will help me make it through, right? A hat would be a logical choice. Yes, that might have been a good idea, if it were not for the horrible, tangled mess that exploded from the ball of yarn. If knitting is going to take the credit for good feelings, good times, coping with life, and everything else, I suppose it will have to receive a bit of blame occasionally. That's right, there has been an abundance of Aunt Sarah time lately. I like being an aunt, and I love the kids. I just do not always hold up so well to so much of it back-to-back. For a period of about 2 1/2 weeks, I think I had two days without youngsters. That certainly has knocked my productivity down a notch. Add to this the fact that I operate best (and that is relative, to be sure) on a different schedule than the one that kids do, and it is no wonder that I am behind in many areas. I did give the first knitting lesson to the youngest niece. She has been asking to yarn, and I told her I would teach her. She did not quite take to it. I do not know that I am much of a teacher, or perhaps at 4 1/2, she is not ready to learn. As it turns out, she had given a good deal of thought to this yarn adventure. When she saw that the yarn and needles we were using were sitting on the table while I was knitting something else, she was perplexed. She wondered why I was not knitting her scarf. I explained that I was knitting a baby blanket. Still hopeful that I was knitting for her, she asked if it was for a real baby or a baby doll. She was not brightened at all when I suggested that a scarf could be a nice present for her birthday or for Christmas. Ah, she'll learn. I cannot decide what I should do about the GVC. I would like to send it to time-out, but if I do, I think I may never finish it. I want this sweater, but it may not be meant to be. The seaming on the sleeves was gorgeous, and I hated to rip. I really ought to be able to figure this out, but I feel stumped sometimes. For now, I just take it out of the bag and work on it for a while. It is a good deal of knitting and ripping, but at least I know that the yarn holds up well. The other positive--it makes knitting on the deadline baby blanket less unappealing. I do not recall whose turn it is, but I am going to pick up the needles and make some progress. It is about survival. I do not dislike my knitting, but I am not quite feeling the love, either. That is hiding, but possibly in the stash. When we find each other, it will be good. I have to hold my tongue just so to get this right. While I keep to this unsightly task (srsly--I look even weirder when I seam), you can peer into my mind. It seemed like no sooner had I mailed a package of CrankyPantsPrizes to JessaLu, that one arrived for me. Diane so kindly put together such a lovely collection of gifties. 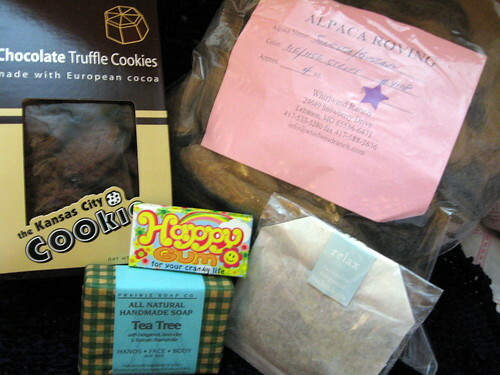 I am looking forward to hiding from the world and relaxing with these prizes. The gum is just too funny. The fiber is so lovely and soft. I imagine the alpaca as either a hat or a scarf. I am not yet to the skill level where I can think of a yarn and make it, but I am working towards that goal. I am so relieved to have found the camera cable. It was almost where it was supposed to be which only makes the time spent looking for it even more embarrassing. However, I am not going to stay caught up in that, but rather celebrate the discovery. I cannot understand what has happened to the camera cable. I have straightened up and sorted and still cannot find it. I do not know if this is an indication of what is happening with my brain, but I do know that it has been struggling a bit lately. 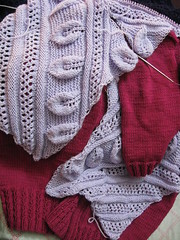 I was working on my Golden Vintage Cardigan, and was completely stuck on the sleeves. I reached the sleeve cap instructions, and thought there was a terrible error. It did not occur to me to do the math between the numbers from directions earlier in the sleeve and those in the cap. No, two little letters--CO, stuck me. I puzzled over and over, "How can I CO stitches at the beginning of the next two rows and have fewer stitches than I currently have?" It took the help of a friend to remind me that CO can mean Cast Off, too. I could hardly believe that I had needed to set the knitting aside and get help on that one. Of course, this means it remains set aside, and I have not worked on it in longer than I care to calculate. The trouble has not just been that the brain will not work, but that it alternates with working overtime. With some extra effort, I have managed to get it closer to on track. Sunday afternoon, I put some Futurama in the dvd player and knit on the July psc sock. The combination of mindless viewing with charted socknitting was a winner. I was able to zone in and out of what I was watching, but my mind could not wander too far with the chart filled with twisted and traveling stitches. I like the way the sock looks. I wish I could show my progress. I am going to have to do something about this camera cable situation, because not being able to add a photo is getting to me. Yeah, I cannot take it any longer. Here's a picture of my niece holding my mom's new puppy, Harvey.